Puttu a traditional breakfast in many south-indian homes. 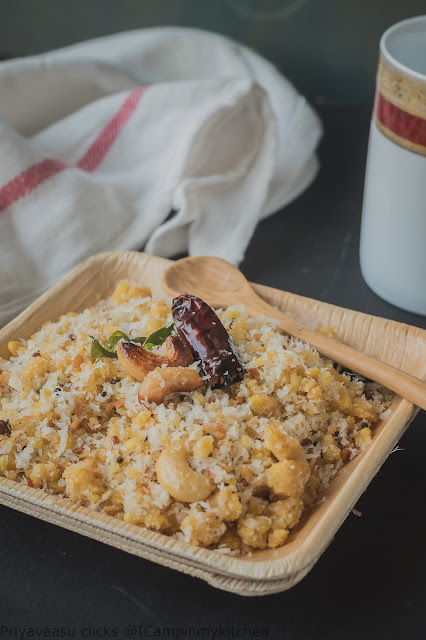 A pretty easy dish to make, can be made to look fancy if you have that puttu maker or else a simple bowl and a steamer would do. Rice flour typically an easy to digest ingredient, i know many you would prefer puttu or idiyappam as their safe bet, when travelling and eating at unknown roadside shops. Today's recipe a protein powerhouse, entirely made with dal. Soak, grind, steam and hog! 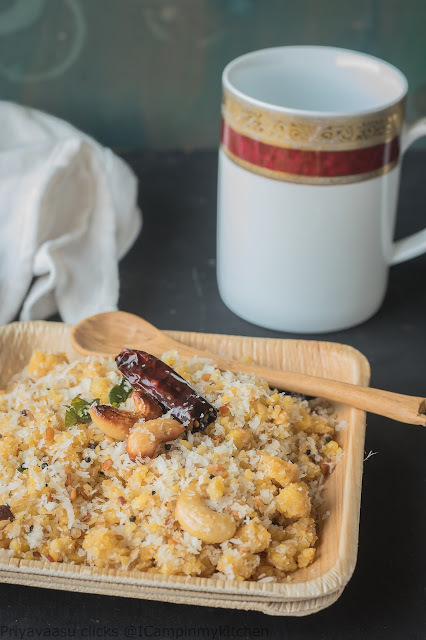 Soaking is all consumes time, once it is ready the dish gets done in minutes, you can serve this for breakfast or as evening snack with some hot chai/coffee. Take all the dals mentioned above in a bowl. Wash twice in water. Do not waste the dal-washed water, use it for watering the plants. Soak the mixed dal for an 2 hours, minimum. I usually have my breakfast by 10/10:30 so i soak it around 7:30 before leaving for my yoga class. Once it is soaked for the said time, drain the excess water, take the dal in a small mixer, pulse grind it to a coarse mixture. Take care while grinding, if you grind it continuously you will end up with dal batter, we don't want dal batter, we want coarsely ground dal mixture. So just pulse it. If you mixer doesn't budge, open and mix it once or twice with a spoon and pulse it again. Once you get it coarse, remove it to a microwave safe shallow bowl. Microwave high for a minute and half. The excess moisture in the dal will evaporate and you will get dry mix, which can be crumbled. Another way to do this is to steam the mix. 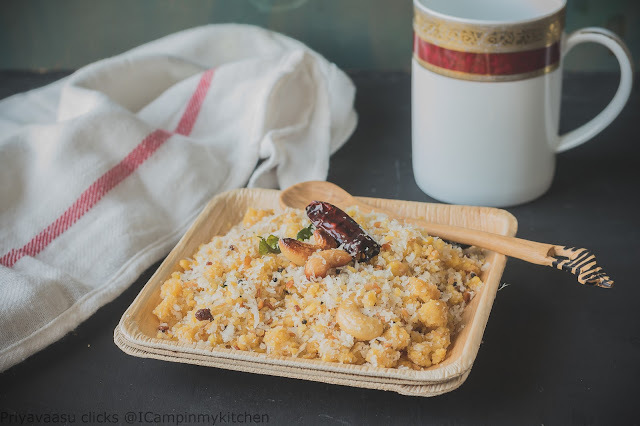 Take the coarsely ground dal in a idly plate, steam cook for 10-12 minutes to get steamed dal mix, which can be crumbled later. I prefer the MW as it takes less time and less vessels too! Once the dal is cooked, heat oil in a sauce pan, splutter mustard seeds, add hing, broken chilies, curry leaves let it saute for minute. Now add chana dal and urad dal and saute until it turns golden brown. Finally add cashewnuts and saute until it changes color, take care not to burn it. Now to this add the crumbled dal mixture.Saute it well. Keep the flame simmer, cover and cook for a minute or two. Remove the cover, add salt and coconut to this and mix well. Let this be on the heat for 3-4 minutes. Remove and serve it hot along with coffee! That is such a protein packed breakfast Priya. Looks absolutely delicious with coconut. It sounds so filling and hearty. Awesome ! Power packed with protein ! And those nuts must be giving it a great crunch! I think the steamed version sounds good to me , safer ! What do you say ? Have seen this dal puttu long back in a TV show, till that day i was looking for a chance to make this dish, am yet to make them. Seriously am in love with this healthy protein rich puttu Priya. I have always been a big fan of my chithi's sweet puttu, but this puttu with dal is very interesting priya !! Dal puttu looks fantastic !! and how wonderful the texture is .. That microwave version is fantastic ! !Will try some day ... The pictures have the perfect mood , so dreamy they are !! This sounds similar to paruppu usli though we use only one or 2 varieties of dal. With the nuts and seasonings, this must be very delicious! Lovely.. I usually try different versions of puttu but using dal is totally new.. Yummy share!! Wow, definitely it's a protein packed food, love the idea of using all the dal in one dish.With those tempering and the grated coconut, it must be delicious !!! I usually hate to steam cook as there are so many vessels to be cleaned after. MW is the best choice for this type of cooking and to make our lives easier. This dal puttu sounds wonderful. Perfect to have on a rainy day with a cup of coffee..
Wow seriously awesome Priya, such a lovely dish to enjoy!.. I am so loving this..fantastic dish. What a delight to see a savory puttu. I love the sweet puttu but have never made it myself. Love the lentil based puttu and this would be a great after school snack for kids. I haven'e ever tried steamed dal puttu ever or to be frank I never got chance to try the classic rice puttu. May be one day I should try it, as it looks healthy and of course must be tasty too. I haven't heard of this exciting breakfast dish but I've fallen in love it. Simple to make and so flavorful. Bookmarked it try it. Thanks for sharing, Priya. This is super healthy, protein rich breakfast for sure.